ROME (CNS) — The Catholic Church cannot be built and the Christian faith cannot be spread without the contagious joy of knowing Christ, Pope Francis said. The joy that Christ proclaims is what lays the foundations: “Without this joy, without this happiness you can’t build a church. You can’t establish a Christian community,” he said in a homily April 24. The pope presided over a Mass at the Church of St. Ignatius of Loyola in Rome for a celebration of thanksgiving for the canonization of St. Jose de Anchieta, a Spanish-born Jesuit who traveled to Brazil in 1553 and became known as the Apostle of Brazil. Pope Francis declared the new saint April 3 without requiring the verification of a miracle through the blessed’s intercession or holding a canonization ceremony. Sent to Brazil at 19, the young man had not studied theology or philosophy like many priests; instead he was someone who had experienced Jesus and “let himself be filled with joy” and radiate God’s light, the pope said. “This was and is his holiness. He wasn’t afraid of joy” and he knew how to communicate it, he said. Paraphrasing Pope Benedict XVI, Pope Francis said, “The church doesn’t grow through proselytism, but by attraction” through people living and witnessing the joy Christ proclaims. 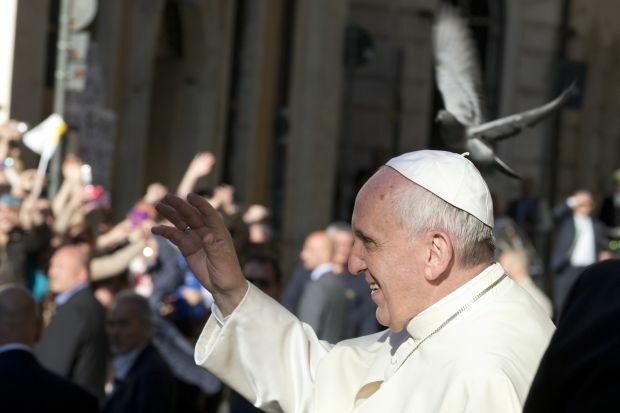 Like the crippled beggar who publicly, freely and joyfully praised God in the temple after his healing through St. Peter, that vivid and sincere show of happiness “is contagious” and “this is how the church grows,” Pope Francis said. Sometimes it’s difficult for people to believe such immense joy from encountering Christ is possible, the pope said. “It seems risky to us and we feel tempted to take shelter in skepticism, to ‘not exaggerate,'” he said. This tendency to believe the imaginary more than the living reality of Jesus is a “process of relativizing the faith” and prevents people from ever encountering God and experiencing his presence, he said.